Authors: Eremina M.G., Slesarenko N.A., Roschepkin V.V., Koshkin A.P. The relevance of the topic is due to the rare occurrence in our locality of skin lesions of nematodes of the species Ancylostoma, Stronguloides, Necator, which are widespread in the tropics and subtropics, but now, due to the increasing migration of the population around the world, present a difficult diagnostic problem and cause difficulties in choosing tactics of treatment. All articles of the authors: Eremina M.G. , Koshkin A.P. , Roshchepkin V.V. Authors: Tlish M.M., Sorokina N.V. Objective: to increase efficiency and to reduce the time of treatment of patients with circumscribed sclerodermia. Material and Methods. 60 patients with circumscribed sclerodermia were under supervision. Two groups of these patients were formed with method of adaptive randomization. In the comparison group the patients received standard therapy according to the federal clinical guidelines. In the general group the standard complex treatment with additional antioxidant therapy was underwent. The course of treatment in all patients was 21 days. The results of treatment were evaluated in accordance with the dynamics of cutaneous pathological process and the concentration of common an-tioxidants. Results. Based on the obtained results of the assessment of the dynamics of the cutaneous pathological process, it is obvious that the regress of dermatosis was more rapid and more active in the general group and was accompanied by a more pronounced increase in the total antioxidant activity of the blood. Conclusion. The proposed method of treatment, having an antioxidant effect and high clinical efficacy, enhances the general antioxidant activity of the blood and allows reducing the duration of treatment of patients with circumscribed scleroderma and, as a consequence, the course of systemic and local corticosteroid therapy. All articles of the authors: Sorokina N.V. , Tlish M.M. 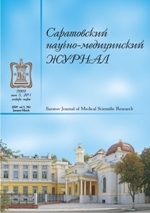 Authors: Myl'nikov A.M., Nechaeva O.V., Zayarskiy D.A., Bespalova N.V., Mudrak D.A., Navolokin N.A. Objective: to study the wound healing activity of the gel form of the "Mellisol" preparation containing nanoaggregates of flavonoids stabilized with polyazolidine ammonium modified with iodine hydrate ions on a model of experimental planar wounds of rats. Material and Methods. An investigation of the wound healing activity of the gel form of the "Mellisol" preparation was carried out in vivo in 18 white laboratory rats of the Wistar line. Simulation of experimental planar wounds was performed according to the standard procedure described in the preclinical testing manual. Results. In the course of the studies, it was established that a statistically significant (p=0.045) acceleration of healing on the 12th day of the experiment occurred in animals of the experimental group on whose wounds the gel form of the cosmetic means "Mellisol" was applied, and the complete healing of the wound defect occurred on the 21st day after operation. Conclusion. The gel form of the preparation "Mellisol" is characterized by a high level of antimicrobial and regenerative activity reliably reducing the healing time for planar wounds without the development of microbial complications. All articles of the authors: Bespalova N.V. , Nechaeva O.V., Zayarsky D.A.